This prayer after confession was written by St. Frances Xavier Cabrini (pictured above), a nun who helped found the Missionary Sisters of the Sacred Heart. This was a religious institute dedicated to serving many community needs, most notably those of Italian immigrants to America in the late 19th and early 20th centuries. 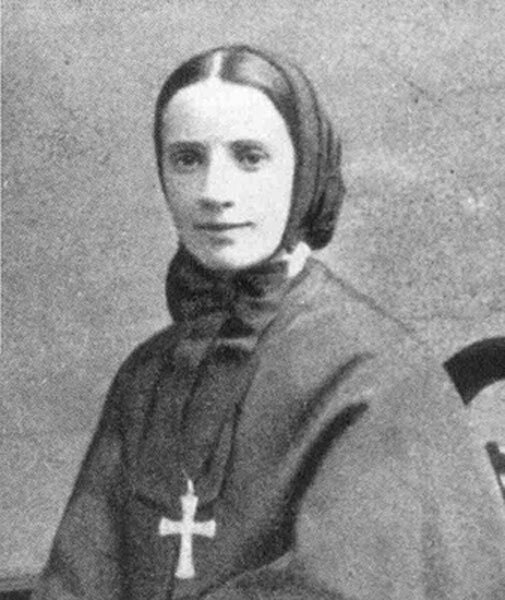 Under her care, 67 religious houses, schools, and charitable institutions such as orphanages and hospitals were established throughout the United States, Italy, England and even in Central and South America from 1880 until her death in 1917. She expresses some wonderful saintly attitudes in her prayer below that we should all try to have as well: a genuine sense of contrition for sins, great humility, a hunger for holiness and being in one with God, and a healthy disdain for the spiritual affliction known as vainglory. My dearest Jesus, I have told all my sins as well as I could. I tried hard to make a good confession. I feel sure that you have forgiven me. I thank You. It is only because of all Your sufferings that I can go to confession and free myself from my sins. Your Heart is full of love and mercy for poor sinners. I love You because You are so good to me. My loving Saviour, I shall try to keep from sin and to love You more each day. My dear Mother Mary, pray for me and help me to keep my promises. Protect me and do not let me fall back into sin. Almighty God, kneeling before Your Divine Majesty, I adore You and because You command me, I dare approach Your divine Heart. But what shall I say if You do not enlighten me with a ray of Your divine light? Speak to my soul, O Lord, and command me to listen to Your voice. Enlighten my will to put Your words into practice. Pour Your grace into my heart; lift up my soul weighed down by my sins; raise my mind to heavenly things, so that earthly desires may no longer appeal to me. Speak to my soul with Your divine omnipotence, for You are my salvation, my life, and my peace, in time and in eternity. Strengthen me with the grace of Your Holy Spirit and give Your peace to my soul that I may be free from all needless worry and care. Help me to desire always that which is pleasing and acceptable to You so that Your Will may be my will, Grant that I may rid myself of all unholy desires, and that for Your love I may remain unknown in this world, and be known only to You. Mother Cabrini, much like St. Paul, wishes to glory in her weakness towards the end of this prayer. (St. Paul once wrote concerning his hardships in spreading the Gospel “I will glory in my infirmities, that the strength of Christ may dwell in me…. For when I am weak I am strong” 2 Cor 12:9-10.) She lived her life filled with missionary zeal for Christ and in Christ, (her motto was “I can do all things in Him”), overcoming obstacles for His sake. For example, she made numerous trips by boat between Italy and America to bring new sisters for her houses even though she had a great fear of the ocean. (This was way before airplane travel, remember.) She clearly wished to give Jesus free reign to show His love through her, so that her will could be united with His. In this regard, she once wrote that she would go anywhere or do anything to communicate His love to those who didn't know Him or had forgotten Him. Yet vainglory can afflict any of us. Our egos can oftentimes get in the way of doing God’s work, when we wish to advance our own needs and pleasures at His expense. Mother Cabrini clearly views herself in this prayer more like the Publican in the famous parable, a sinner asking God for Mercy, rather than the Pharisee boasting about his sanctimoniousness (Luke 18:9-14). Keep in mind that such humility, like sanctity itself, is not just for those who have been canonized as saints! We must adopt this attitude of being God’s loving humble servants as well. We cannot get to heaven solely on our own strength. As Jesus said in His Last Supper discourse “I am the vine and you are the branches. He who abides in me and I in him, he bears much fruit; for without me you can do nothing”(John 15:5).